White tea, unlike other teas, undergoes very little processing (steaming, rolling, and oxidation) leaving the appearance and the cell structure of the leaves basically unaltered. This purity may be why some researchers have said that white tea carries a greater concentration of antioxidants than all of the teas that originate from green tea. White tea is held to be particularly valuable for lowering heat, stimulating the intestinal tract and have all of the benefit of the green tea. 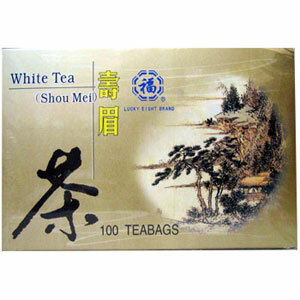 White Tea (also known as “Shou Mei”) is grown in the wild mountains of the Fujian Province in China and comes from the tender young buds and leaves that remain after the legendary silver needle white tea has been harvested. White tea, unlike other teas, undergoes very little processing (steaming, rolling, and oxidation) leaving the appearance and the cell structure of the leaves basically unaltered. This purity may be why some researchers have said that white tea carries a greater concentration of antioxidants than all of the teas that originate from green tea. White tea is held to be particularly valuable for lowering heat, stimulating the intestinal tract and have all of the benefit of the green tea. The white tea’s silvery leaves help product a subtle, complex and mildly sweet taste. Lowers heat, stimulates the intestinal tract and have all of the benefits of green tea. Place a tea bag in a cup. Pour 8 ounces of fresh hot boiling water over tea bag. Steep for 2-3 minutes. Sweeten with honey or sugar if desired. In a pot: Use one tea bag per person. Place the tea bags in a warm pot. Pour in fresh boiling water. Let stand for 2-3 minutes.